Candela’s SmoothPeel is possibly the best alternative to a chemical peel to reach the aesthetic laser market. The SmoothPeel’s ergonomic handpiece makes the device easy to control. SmoothPeel treatments are fast, require nominal recovery time and produce outstanding results. Countless practitioners attest that SmoothPeel therapy is superior to microdermabrasion. SunrayLaser.com is always pleased to offer Candela products, long considered some of the finest aesthetic medical devices available. Our position in the refurbished device market has enabled us to pass along unprecedented savings on a SmoothPeel in outstanding operating condition. Please contact us today to hear our price or to discuss any Candela or Syneron product. 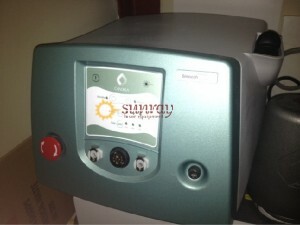 An expertly refurbished Candela SmoothPeel from SunrayLaser.com can capture your practice additional clientele. Sunray guarantees that each unit we sell will operate as intended and per the specifications set by the manufacturer. Our consultants are thoroughly familiar with the Candela portfolio, and enjoy discussing the medical lasers that best match your needs. You are just one step from discovering the rewards of adding the Candela SmoothPeel to your lineup of therapeutic and aesthetic lasers. The next step is easy. Simply fill in the form below, and let one of our senior laser consultants know how to get in touch.